ESIGNED BY A LICENSED MASSAGE THERAPIST! Give deep therapeutic Golf Ball Massage while comfortably protecting your hand. Also great to use on yourself or a partner. Ergonomic design. Save your thumbs. For hot/cold therapies, balls can be heated or cooled. Small enough to maintain skin-to-skin contact. Add therapeutic modality “Golf Ball Massage” to your services. A perfect gift for valued clients. Put muscle health back in your own hands. Take anywhere; use any time. A pre- and post-game necessity. Great unique and inexpensive gift. Wash with soap and warm water after each use. 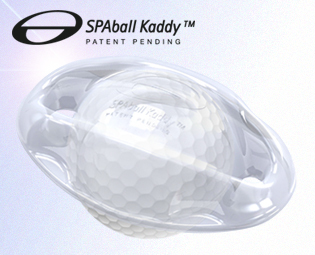 The SPAball Kaddy has not been evaluated by the FDA and is not intended to treat, cure or prevent any disease or condition. If you have a health condition or concern, consult a physician. A golf ball should never be applied directly to wounds, bruises or sprains. For external use only.